Overture Center and Sandra Gajic, incoming president and CEO, announced the restoration of the Capitol Theater’s original Grand Barton Organ can commence, thanks to a successful fundraising campaign with support from Madison Community Foundation. It is one of only a few historic theater organs still in its original home and one of three unaltered Barton Organs still in existence. Its majesty was recognized in 1990 by the Organ Historical Society as “an instrument of exceptional merit,” a recognition that is usually bestowed on church organs. The Organ underwent minor restoration projects in 1995 and 2003, but a comprehensive restoration is sorely needed. 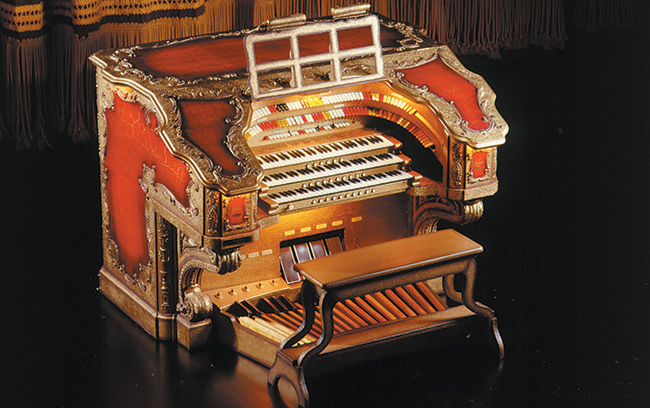 In March 2018, work was completed on the “toy counter”—the traps and sound effects of the organ—made possible by a grant from the American Theater Organ Society. In the next phase, restorers will utilize only parts and materials that are as similar to the original as possible. Each stage will require careful disassembly of the mechanical units, meticulous cleaning, and then the replacement or refurbishing of the worn components. The Grand Barton Organ has been delighting audience members in the Capitol Theater since it opened in 1928. Ninety years later, the Grand Barton Organ continues to entertain visitors at events throughout the year, including Overture’s silent film series Duck Soup Cinema.